Sometimes sleeper and breakout picks are just too trendy, forcing our Scott White to find new favorites. Here are some of the players he keeps drafting. There are Sleepers. There are Breakouts. And then there are the players I'm actually drafting. In many cases, they overlap. I tend to target the players I think are the best values, after all. But sometimes I haven't yet come to that conclusion for one who nonetheless keeps finding his way onto my roster. And other times my precious sleeper or breakout pick always seems to be beyond my reach, the rest of the industry being just as high on him. So while these 16 players aren't necessarily my favorites (though many of them are), I clearly have a kinship with them. There must be something I appreciate about them that the rest of the Fantasy baseball-playing world does not. It's me putting my mouth where my money is, I guess, for whatever that's worth to you. For each player, I've included the average draft position (ADP) from three sources: CBS Head-to-Head points, CBS Rotisserie and FantasyPros, which averages ADP data from several different sites (strictly Rotisserie). Since I'm mostly drafting with others in the industry, our results come closest to matching FantasyPros ADP. Just something to keep in mind. My beloved of course had to appear on this list. The upside Adalberto Mondesi showed in the second half last year makes him one just two or three players in the entire player pool with a chance at a 20-homer, 50-steal season (if not better), and locking in those kinds of numbers with a fourth-round pick frees you up to do so much in a 5x5 draft. It's worth noting the upside is considerable in points leagues as well, but since steals aren't a requirement, he tends to go three or four rounds later. Zack Greinke is the ace nobody wants, which makes him the one I always get. In terms of overall ceiling, I guess I get it (though it's worth pointing out he has led the majors in ERA twice), but if the risk of drafting a pitcher early is having something go wrong with his arm, Greinke is safer than most. He's of a dying breed of control-and-command specialists, which means he doesn't rely on big velocity and is efficient enough to throw 200 innings year after year. A key to every draft plan is building in opportunities to wait, and Jose Abreu is my ticket to doing just that at first base — and a welcome one given the sudden shortage of standout talent at the position. Make no mistake: He has been a standout, at least in 5x5 leagues, basically every year but last year, delivering near-elite levels of batting average, home runs and RBI. Batting average is the one that gets overlooked, I think, but his career low prior to last year was .290. And while last year counts for something, nothing in his batted-profile suggests he's actually on the decline. I'm sure there's a point when Justin Turner's injury history and likely propensity for injury at age 34 wouldn't be worth it, but Round 7, where he goes in the average 12-team league, isn't it. He's one of the safest bets for batting average, with all the RBI and run-scoring potential you'd expect for a middle-of-the-order presence. And while last year's home run pace isn't bad by any measure, it took him a while to regain his power stroke after recovering from a broken hamate bone. I expect second- or third-round production when he's healthy. I'm guessing Robinson Cano gets dinged because he's 36, but he was basically the same guy for all five of his years in Seattle. And that guy still has plenty to bring to the table, not the least of which is durability. Despite serving an 80-game PED suspension last year, he still played 80 games and hadn't played fewer than 150 in a season since 2006. Double last year's totals, and he's a .303 hitter with 20 homers, 100 RBI and 88 runs, which is pretty typical for him and not so far behind the expected production of like an Anthony Rendon. A priority for me in drafts this season is targeting pitchers who have proven capable of ace-level production, because they're few and far between in an era when "eating innings" is no longer valued. To me, the best indicator of someone who has the leeway to throw 200 is someone who has done it before, and Archer did it three straight years prior to last year. The ERA was kind of high in two of them, but the strikeout totals were through the roof. And the FIP suggests a much higher ceiling that he has a better chance of reaching now that he's out of the AL East. 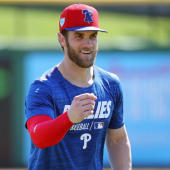 If the capacity for both 200 innings and 200 strikeouts is the most short-handed way of describing an ace (and I think it is given that most other shortcomings would stop a pitcher on the way to those totals), then Cole Hamels is still right there at age 35, having just completed a near 190/190 season. No, he's not as good as he looked in his partial season with the Cubs, compiling a 2.36 ERA in 12 starts, but pitching in Texas was so obviously a disaster for him (particularly when it comes to home runs allowed) that I think something closer to his full-season numbers (think a mid-threes ERA and 1.20 WHIP) is a reasonable expectation. An encouraging spring hasn't helped Yu Darvish gain any traction in drafts, which suggests to me that the initial push to downgrade him was less because of the time he lost to an elbow injury and more because he struggled in eight starts with the Cubs. It wasn't an issue of stuff, though. The velocity was the same as always, and he began to turn things around in the four starts leading up to the injury. He was routinely drafted as an ace prior to last year and represents perhaps the most obvious opportunity to get one of that increasingly rare breed of pitchers at a steep discount. Among relievers with at least 50 innings last year, Jose Leclerc ranked third in ERA, third in FIP, fourth in WHIP, third in FIP, first in H/9, eighth in K/9 ... and 104th in BB/9. So I guess it's that last number that has Fantasy players treating him like a second-rate closer even though he's one of maybe 15 or so with a solitary claim to the role. And honestly, that sort of walk rate isn't so rare for a pitcher with his sort of stuff. Aroldis Chapman, Craig Kimbrel and Adam Ottavino are among the many noteworthy names whose walk rates were worse last year, and you don't see them getting dinged for it. Remember my short-handed definition of an ace: a pitcher with the capacity for both 200 innings and 200 strikeouts? Rick Porcello had 190 of each last year — and in fact the innings represented a three-year low for him. Granted, he's not an ace — and may be the clearest exception to the rule — because he gives up too many home runs and doesn't miss enough bats to help much with ERA. But strikeout rate is only as useful as the number of innings a pitcher throws, and Porcello's obviously yields a high total. Add that he's backed by a first-rate offense, and ERA might be his only sore spot. Jesse Winker's miserable showing this spring has made him all the more attainable in drafts, but manager David Bell has been steadfast in his desire to get the 25-year-old everyday at-bats, potentially even at the top of the order. It may be an impractical goal for however long Matt Kemp is on the roster, but if Winker does what I expect him to do, he'll quickly render Kemp obsolete. Winker's batted-ball profile last year looked like the typical Joey Votto season, right down to him having more walks than strikeouts, and the power that had long gone unrealized began to show up in the weeks leading up to his season-ending shoulder injury. Pete Alonso entered spring training as the favorite for the starting first base job and has put up the kind of numbers that should make him a shoo-in. And it appears now he has indeed secured job, which means my days of snagging him in Round 20 and beyond are probably over. It never made sense why he lasted so long. Even if you assumed the Mets would play service-time games with him, it put him arriving on the same timetable as Vladimir Guerrero. Between his 80-grade power and plus batting eye, I'm expecting Rhys Hoskins-level production right away. Just projecting out Franmil Reyes' numbers in 261 at-bats last year — the .280 batting average and 16 home runs — paints a rosy picture, but even it understates the upside. He was a flailing mess for the first 38 of those 87 games, made a return trip the minors, then came back to hit .318 with 10 homers and a .933 OPS the rest of the way. His power potential is evident in his elite exit velocity, and yet his strikeout rate (much better in that second stint) and all-fields hitting also make him out to be a useful source of batting average. The main question is if he'll play every day, but I'll take my chances on him forcing the issue, particularly in five-outfielder leagues. Early reports had Matt Barnes as the favorite to inherit the closer role in Boston, but at the time, most of us assumed the Red Sox would eventually bring in Craig Kimbrel or someone else of high stature. And then when it became apparent they wouldn't, Barnes was getting throttled in spring training. He has been much better lately, having recently discovered he was tipping his pitches, while his primary competition, Ryan Brasier, has barely pitched at all. So I think Barnes is in, and while his ERA was kind of high last year, he had a 2.71 FIP and an even better K/9 than Kimbrel. The earliest projected depth charts that popped up in various places on the internet showed Brandon Lowe not even cracking the major-league roster, but when the Rays signed him to a six-year deal earlier this week, it basically clinched it. He looks like an offensive force, having hit .297 with 22 homers and a .949 OPS in just 380 at-bats between two minor-league stops last year, and has also been the Rays' best hitter this spring. Between first base, second base and left field, the at-bats will be there for him, and the production could vault him to must-start status at a next-to-nothing price.